For many businesses and households, it’s time to start looking ahead to a new year. But for those of us in enrollment marketing, we’re in the middle of our academic year. Time to take a look at our progress over the last six months… and begin preparations for next fall. I know you’re busy with so many other priorities, and there are always fires that need to be stomped out. But you can only position yourself for enrollment marketing success by having a well-devised education marketing plan. Marketing is not a game of chance. Because you’re not always guaranteed the results you want, enrollment marketing can seem like a gamble. 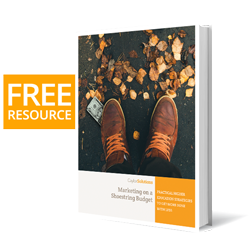 While sometimes you’ll get lucky in the short-term, long-term success comes to those who prepare and implement their education marketing plan well from year to year. Like all good plans, it begins with a look backward. Step #1: Evaluate your performance this past academic year. To get where you want to be, start where you are. Get to know the basics of an education marketing plan, and then analyze your performance by reviewing your priorities and Key Performance Indicators. 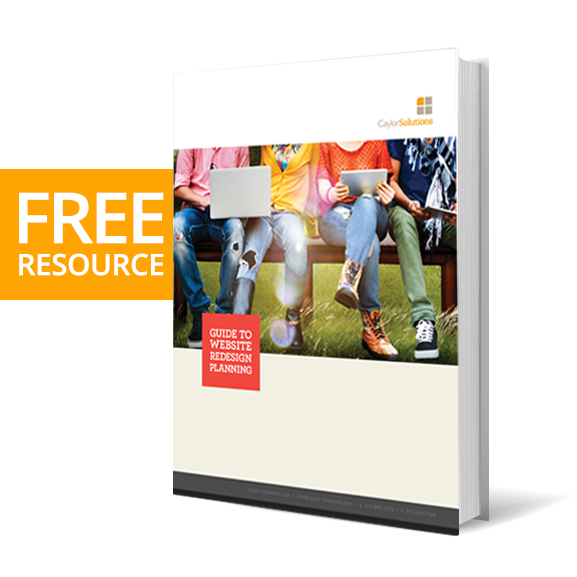 Is your enrollment marketing bringing in enough new students? There are all kinds of ways to measure your progress in enrollment marketing — but the fundamental metric is enrollment. Evaluate your funnel from top to bottom. How many new students are enrolling at your school? Where are the pain points? If you’re not getting enough inquiries at the top of the funnel, then you might have a traffic problem. To correct that, put more focus on content marketing in your education marketing plan to generate more leads. You can also generate more excitement on social media by planning a couple giveaways throughout the year. If you have plenty of traffic to your website but few prospective students are giving you their information, that means you’re struggling in the middle of your funnel. Try planning out gated content offers such as an eBook to entice visitors to trade their contact info for your valuable resource. Which channels performed best for you? Look at your marketing channels closely and see which ones are working best, which ones need cut, and which ones need more resources to be successful. Which social media platform is working out best? Do you have a presence on all the social media platforms where your audience is hanging out? Which ones are performing better, paid or free? If paid channels have the upper hand, is using them sustainable for your budget going forward? Are there platforms you want to start out on this year that will need resources allocated to them for a successful launch? If not, ask for more in the next budget cycle or cut back on some expenses if that’s not workable. No matter how brilliant your strategy is, it won’t work if you don’t have the budget for it. Knowing your audience will help you determine what channels they are hanging out on. This means that you’ll know how much to budget for those specific channels. What are your organization’s priorities and KPIs? Having social media key performance indicators, or KPIs, is helpful in two ways. First, it helps the marketing team measure success. For example, if your institution’s goal was to increase Twitter clickthrough rates by 5% but you managed 4%, you know you’ve done fairly well. Secondly, it gives management and the marketing team a common goal. What tools and expertise do you need to achieve your goals? To achieve your goals, you need to invest in tools like marketing automation tools and metrics software. Make sure you accommodate them in your budget. What work are you going to outsource? Outsourcing has so many benefits. Decide which part of your work will be done in-house and what will need external expertise. Calculate the cost of hiring outside agencies or freelancers. To stay competitive you’ve got to keep up with the trends. Here are the three big things that are catching on right now: Augmented reality, Voice-assisted technology, and Blockchain. With this technology, your college can come alive to prospective students in an amazing way. You can do virtual tours of your campus. Imagine showing off your dorms, cafeteria, and sports facilities to prospective students at the next college fair! 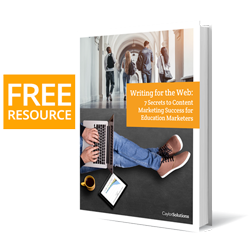 Higher education marketers need to quickly come to grips with this innovation. Many people now have voice-ready devices in their homes and hands. More and more people are talking into their devices to find answers to their questions. Whether it’s Apple’s Siri or Amazon’s Echo and Alexa, the technology is now readily available. This means higher education websites need to be optimized for voice search so they show up in search engines or they’ll lose the competitive edge. There’s more to Blockchain than Bitcoin and virtual currencies. It’s the next big thing. I believe it’ll change the education sector in unimaginable ways. For example, instead of having a seal on your transcript, it’ll actually be in the cloud in a Blockchain that’s uniquely tied to your identity and can never be altered. You would have a key to access it of course. That’s just one example. I’m sure there are many other ways for education marketers to take advantage of this technology. With emerging technologies, it’s crucial to be an early adopter – otherwise, you’ll lose ground on your competitors. Planning for marketing success can be tricky and taxing. But don’t get discouraged or overwhelmed. There’s a lot to enrollment marketing. But if you take it one step at a time, you’ll get your plan done and save yourself a ton of frustration in the future by having it all written out ahead of time. Once you start seeing the fruits of all your hard work, you’ll be glad you took the time to plan properly.